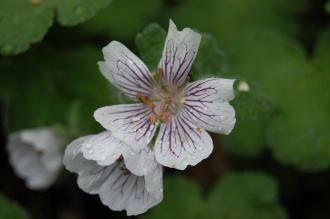 Geranium renardii is a clump forming herbaceous perennial. Its green/ gray leaves are palmately lobed with indented margins and broadly circular in form, simple, up to 6cm across and 8cm broad, with a velvet textured upper surface. Its white flowers are five petaled with purple veins and are up to 3cm in width. Its fruits are schizocarps, which splits into mericarps. Geranium renardii, commonly known as Renards Cranesbill and Renards Geranium, is native the Caucasus and was introduced into the UK in 1935. The etymological root of the binomial name Geranium from the Greek geranos ’a crane’, the fruit of the plant resembling the head and beak of the bird, hence Cranesbill. Renardii was named after Charles Claude Renard (1809 – 1886) a naturalist based in Moscow. 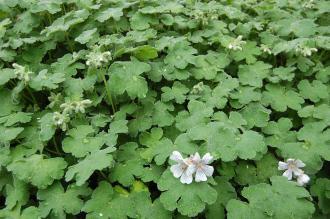 The landscape architect may find Geranium renardii useful as a low growing ground cover, herbaceous perennial. It is also drought tolerant once established. Ecologically, G. renardii is attractive to bees and pollinating insects. The Royal Horticultural Society has given G. renardii their prestigious Award of Garden Merit in 1993. G. renardii prefers moist, well-drained soils. It tolerates most pH of soil. This plant flowers best on poor soils. It will not tolerate waterlogged soils. Geranium renardii requires little maintenance. Large clumps may be divided in spring.